Pasta with Leeks, Prosciutto and Mushrooms, Thyme for Cooking pasta. 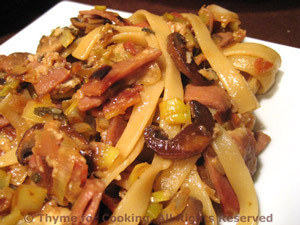 Sautéed leeks, dry-cured ham and mushrooms make a simple, flavorful sauce for pasta. Add mushrooms, ham and sauté about 10 minutes, until everything is starting to turn golden. Add wine or stock, sage and heat through. Pour over hot, cooked pasta, add Parmesan and toss lightly - use a tongs. Serve, extra Parmesan on the side.